Central Group’s Drives division recently completed two jobs for Bibby Hydromap. The two boats Central worked on are survey boats that check the sea bottom to see if oil and gas platforms can bed into the sea floor. They also advise the cable laying companies as to where cables can be laid and provide advice on what the surface of the sea floor is like so they can decide on the insulation required for the cables. Central’s first job was to carry out a drive replacement on the Bibby Chartwell (pictured). The drive ran the power pack which controlled all the pneumatics on the boat and the job was completed on emergency service. 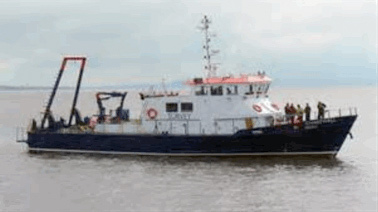 As soon as the drive was commissioned it went out to assist with the surveying of the Irish Sea Pioneer; a support platform that Central worked on in 2014, replacing a total of 48 drives. The second job was on the Bibby Tethra. The drive that had failed was a132KW ABB low Harmonic drive, which had to be removed from the ship through the access hatch for repair. The drive was taken to Central’s workshop where the complex repair job was completed to exceptional standards. We react quickly and efficiently to ensure minimum disruption for our clients. Trained experts can handle all elements of a complex project.